Make a training programme for your client. If desired, balance and isometric strength tests can be performed to evaluate the initial fitness level of the user. The testing equipment is a part of the HUR SmartTouch system. Your customer starts exercising by logging in at the Kiosk or by going directly to the first HUR SmartTouch exercise device. In HUR circuit, rotation proceeds in a precise order, which results in less queuing for machines. When the customer shows their USER ID to a HUR strength training machine, the lever arms, seat, load and repetitions set up automatically. The HUR SmartTouch system also includes cardio workouts. With HUR FreeTrainer, equipment-free exercises can be added to the training programme. Your customer can follow their progress online in their HUR SmartTouch end user profile. 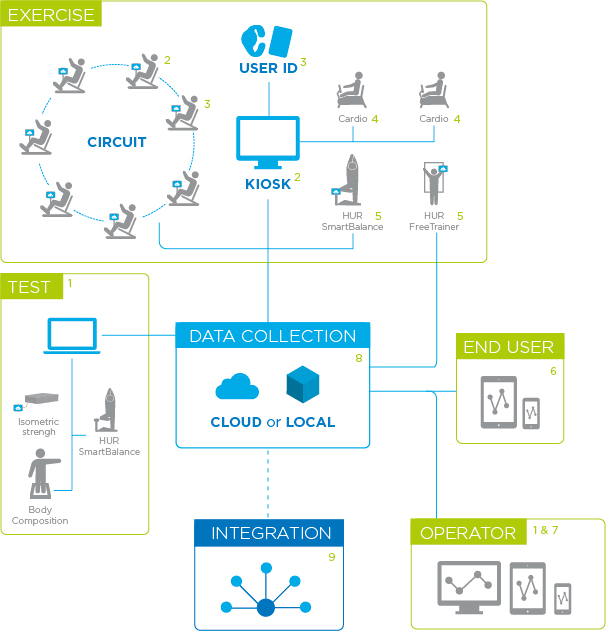 HUR SmartTouch provides the metrics to track your clients’ exercise performance, their progress, use of equipment and the status of your facility (facilities). The HUR SmartTouch installation can be cloud-based or connected to a local server. HUR SmartTouch can be integrated with other applications/programs using Web Services or by using an integration engine for the HL7 interface.